A drunk driver who killed a “doting” father in a head on crash has been jailed after being found four times over the legal drink drive limit. Craig Allen, 35 of no fixed abode, was also found with traces of cocaine in his system after the fatal collision in Wootton Wawen in April. 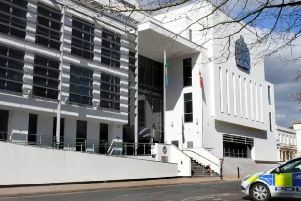 Allen pleaded guilty to causing death by dangerous driving and to driving with excess alcohol when he appeared at Coventry Crown Court on Thursday. His original sentence of nine years was reduced to six years for his early guilty plea. Father-of-two Robert Loach was killed after the head on collision on the A3400 on April 25. The 27-year-old motorcyclist was described by his family as a doting father, and wonderful and loving son. When police arrived at the scene of the crash, Allen’s breath showed a reading of 155mg - more than four times the legal limit of 35mg to drive. He was also found to have traces of cocaine in his system after agreeing to a roadside drug swipe test. Speaking after the sentence was handed down, PC David Bull from Warwickshire Police said: “This was a tragedy which could have been avoided. “The simple fact is that driving when you have been drinking or taking drugs is not just illegal it puts you and other road users at risk. Tributes were since paid to doting dad, Robert who lived in Redditch with his partner, Lian, and two children aged one and three. Lian said after his death: “Robert was the world’s most doting father, a loving and wonderful son and brother to seven cherished siblings.